Excellent customer relationships start with leadership. Having fun with required communications can buy you a lot of goodwill. This week’s article is “Billionaire Elon Musk responds to unhappy Tesla customer on a Friday night, teaching a brilliant lesson in customer service,” by Catherine Clifford. 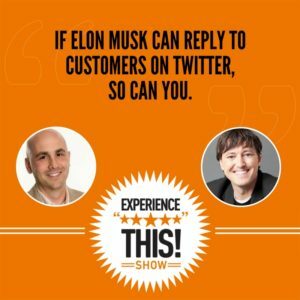 When a customer tweeted at Elon that they had a bad experience with a pushy salesperson at Tesla, he tweeted back (38 minutes later!) that “we just want people to look forward to their next visit, that’s what really matters.” There are many lessons to learn from how Musk deals with this situation. Your speed of response matters, especially if you can show proactive work to make the situation better. The fact that Elon Musk himself is responding to a random comment shows that their leadership is committed to providing an exceptional customer experience for every single customer. The way to get someone to come back to you, again and again, is to provide a remarkable customer experience. Just because it needs to serve a legal purpose doesn’t mean that it needs to be boring or pick a fight. People will generally do the right thing if you give them a chance. Have fun with your required communications. Joey is about halfway through a great new book by Ray Dalio, the head of the largest and best-performing hedge fund in the world, called Principles. Bridgewater Associates has made money for their clients in 23 of the last 26 years. When it comes to advice, Ray says that you need to be aware of two things to be successful: know what the best decisions there are to be made and have the courage to make them. Start writing down your principles, what you know to be true in your personal and professional life. Share these principles so others can have better insight into who you are. 35% of small business owners are wondering, should we be proactively reaching out and nurturing our customer relationships? This stat comes from Oracle’s “Sleepless Over Customer Experience” report. This understandably riles up Joey. 100% of businesses need to proactively reach out to nurture their customer relationships. Joey Golden: Where you'll find inspiring examples of customer experience, great stories of customer service, and tips on how to make your customers love you even more. Dan Gingiss: Always upbeat, and definitely entertaining, customer retention expert, Joey Golden. Joey Golden: And social media expert, Dan Gingiss, serve as your hosts for a weekly dose of positive customer experience. Dan Gingiss: So hold onto your headphones. It's time to Experience This! Joey Golden: Get ready for another episode of the Experience This show! Dan Gingiss: Join us as we discuss the power of admitting a mistake publicly, legal threats that make you laugh, and hedge fund managers with a heart. Joey Golden: Sales people, cease and desist, and principles. Oh my! There are so many great customer experiences articles to read, but who has the time? We summarize them and offer clear takeaways you can implement starting tomorrow. Enjoy this segment of CX Press, where we read the articles so you don't need to. Dan, my friend, you better hold onto something. I'm about to talk about something from Twitter. Joey Golden: I knew that that would get your attention. All right, so this article comes from CNBC, and the title of the article by Catherine Clifford was Billionaire Elon Musk Responds to Unhappy Tesla Customer on a Friday Night, Teaching a Brilliant Lesson in Customer Service. So here's the scene. It's a Friday night. It's 7:38 p.m., and Bobby Gupta, @Bobby_Gupta on Twitter, for those of you paying attention, tweeted @elonmusk to note, "Had a terrible experience with very pushy sales guy from Tesla Stanford shop while shopping for Model X." Dan Gingiss: Say it ain't so, Elon. Joey Golden: Yeah, not good. Not good. But here's where it turns fantastic. 38 minutes later, 38 minutes, Elon Musk, the man himself, replies to the tweet and says, "Def not OK," as in "definitely not okay", but he's staying within those 140 characters, "Def not OK. Just sent a reminder to Tesla stores that we just want people to look forward to their next visit. That's what really matters." Dan Gingiss: All right. So that's incredible for many, many reasons. Let's start with the fact that Bobby Gupta got a response in 38 minutes, which is not a bad time. Very good time, actually. Joey Golden: Incredible time. And from him. Like, this isn't from Tesla General. Right? Like, the people that monitor the Tesla social media tags. This is from Elon himself. I thought that was pretty damn impressive. Dan Gingiss: That's kind of where I was going, but thanks for stealing my thunder. Joey Golden: I just wanted to reiterate what you said. Dan Gingiss: Yeah, appreciate that. But the fact that the guy himself, or maybe one of his handlers, but it seems like the guy himself is responding to customers. We've said before, we'll say again, that customer experience starts at the top. And if you have an owner that believes in treating customers well, like this guy clearly does, this is a great way for him to show that publicly. I absolutely love it. There are some other CEOs on Twitter who are very good at this as well, but the number is pretty small. And a guy of this guy's stature and public nature and stuff, for him to be talking to whoever the heck Bobby Gupta is, but clearly is a Tesla perspective customer or actual customer, it's really amazing. Joey Golden: I agree. I mean, 38 minutes. I think Elon is now running 38 companies or something like that. So the fact that he responds to this, wonderful. I also love, and we don't know this for sure, but if we just take the tweet at face value, his challenge was a pushy sales guy while shopping. It almost implies that this guy isn't actually a customer, he's a prospect. So the fact that Elon would go out of his way to reach a prospect, to me says even more about how he believes what we've talked about before, that idea that your marketing is where the customer experience actually starts. So Elon being irritated that this sales guy was being pushy goes to show that he's like, "No, no, the customer experience is the entire process, not just the sale." Dan Gingiss: Absolutely. And he knows that he could lose a sale off of this guy, and when you lose a sale of a Tesla, that's not like losing a sale of a pack of gum. I mean, this is a lot of money here. So the idea that somebody wanted to buy a car and walked away disappointed is something that Elon Musk should care about. I've said many, many times that companies should not be afraid of complaints, because the people that come online to complain do so because they care about your brand, and they want you to make it right. The ones that don't care about your brand, or don't want you to make it right have already gone onto your competitor. So I think Bobby Gupta is going to still end up with a Tesla, because that's a car that he wants, which is why he's disappointed, and why he's sharing that publicly. Joey Golden: Absolutely. I think so many brands worry about what happens when things go wrong, and yet, all of the research shows that if you have a situation where it goes wrong, and you fix it, the relationship is stronger than if it had gone right the entire time. This is this principle of if it's broken and you fix it, it's stronger than it was if it never broke in the first place. The other thing I really liked about this is, and again, I'm just going at face value of the language in Elon's response, is when he says, "We just want people to look forward to their next visit." To me that implies that he's all about the long game. And talk about a single metric that you can give your customer-facing sales team and your frontline support. You just say, "Look, all you have to do is make sure they have such a good time that they want to have another time with us. That's it. We don't care if you sell to them. We don't care the dollar amount of the sale. It's really just about the feeling that they have when they leave having an interaction with us, that feeling being that they want to come back again and they're actually looking forward to it." Dan Gingiss: Totally agree. I think in this case the customer may not have been feeling that way, but I'll bet you anything that he was feeling that way after he got a personalized tweet from Elon Musk. Joey Golden: Absolutely, not to mention all of the publicity. I mean, this article came from CNBC, but this article was all over the internet of people saying, "Holy cow. Look at Elon Musk." And Bobby Gupta was getting a lot of nice shout outs all over social media and the internet as well, so good on you, Bobby. Dan Gingiss: All right. Let's do some takeaways, Joey. Joey Golden: All right. I think, and I know this is a big one of yours, Dan, number one, speed of response matters. When a customer is unhappy, your goal should be to get to them as quickly as possible. Now, one thing you can even do, and there's almost an implication that this happened, you can try to fix the thing and then respond to him if it's going to be fast enough. So like, in 38 minutes, Elon knew that that's fast. The fact that he sends a reminder to the Tesla stores to kind of clean up their act a little bit makes Bobby feel good. It's a fast response, and it shows proactive work to make the situation better so that people don't have that experience in the future; absolutely loved that. I think the second thing is that every customer matters. Elon is selling cars all over the planet, and the fact that he would take the time to respond to a single customer, or in this case, a single prospect, shows a level of commitment at the individual customer level that, boy, you can't buy that kind of publicity. Right? It's incredible. I think it not only speaks to the overall brand spirit, but it sends a clear message, and we've talked about this before: the importance of great customer experience leadership really needs to happen at the top of the organization. The fact that he is personally tweeting out and saying, "Hey, this is what we believe. This is what we were going to do." Another great point. I think third, and finally, what really matters is that people look forward to their next chance to do business with you, and Musk said that himself. I mean, you really want to set this emotional context, where they've had so much fun, and they've enjoyed it, that they're waiting for the next time. That's how you get customers to keep coming back to you again and again without needing to spend a boatload of time, effort, and money on marketing. Because if they had fun, and they felt like they were treated well, and it was a positive, and dare I say remarkable experience, then they're going to be eager to repeat that in the future. Dan Gingiss: And I'm going to add one more takeaway, Joey, and that is if Elon Musk can reply to customers on Twitter, so can you. Joey Golden: It's shocking how often people use 38 words to describe something when two would do the trick. We're looking at you, lawyers and accountants. Words matter, and there is no excuse for trying to hide what you need. We explore words in messaging in this next iteration of Say What? So, Dan, I have a question for you. Have you ever watched the Netflix show Stranger Things? 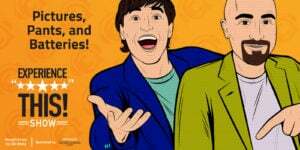 Dan Gingiss: Unfortunately I have not, but as an avid Entertainment Weekly reader since it began publishing 20 years ago, I've definitely read a lot about it. Joey Golden: I always get so much insight into you when we have these conversations. Well, I've watched a few episodes of Stranger Things, and to be candid, thought it was a little too on the stranger side for me. But I may give it another look after a story that I saw by Mina Bloom on the DNAinfo website. So here's the scoop. There's a popup bar that opened in the Logan Square neighborhood of Chicago, not far from you, actually, and it quickly became one of the hottest bars in Chicago. The entire bar is themed after the show Stranger things. It's called the Upside Down, and that name actually references this kind of spooky, alternate reality that is a key element of the show. You can get show-related things like syrup-flavored Eleven's Eggos, which, to be candid, I don't entirely know what it means, but it's something from the show. And you can also hang out in a space that's decorated to look like the rooms in the show. Dan Gingiss: Well, it kind of sounds cool. I mean, it sounds like it's some super fans maybe that have put this together, and that's probably who they're looking for, is other super fans to come enjoy something that feels like one of their favorite shows. Joey Golden: Absolutely. So it's a popular show. The two folks that put together the popup bar are super fans, helped to attach and kind of attract more super fans to their pub, as well as people who might come and become interested in the show because they were there. But here's where things start to get a little interesting, and this is why I wanted to talk about it on this segment of Say What. So, Dan, are you familiar with the concept of a cease and desist letter? Dan Gingiss: Well, you know, Joey, I'm not a recovering attorney like you are. But as a matter of fact, I know a little thing about ceasing and desisting, and I would say that it's a document that is usually written by a lawyer that is sent to somebody that says, basically, "Stop doing this, because you are violating something: either my intellectual property, or my copyright, or whatever it is." And it's used because you have to basically put in writing to somebody to say, "You need to stop this," So that if they continue to not stop it you can bring them to court, and you can show that you gave a best effort to get them to stop. Joey Golden: Are you sure you didn't go to law school? Joey Golden: Wow, buddy. That was a really good answer for a non-lawyer. I love it. And easily understood. You're exactly right. That's what a cease and desist letter is. And usually these things, and I've seen plenty of them, I've even written a couple, I've actually even sent some personally for some of my IP stuff, they're usually filled with incredibly boring legalese, and often they have this really threatening tone, that it's kind of like, "Either do this or else." And what it ends up doing is escalating the situation. Right? It's just jumping in full bore right out of the blocks. That's why a letter from Netflix senior council of content and brand IP is so interesting. The senior council sent a letter to the owners of the owners of the popup bar. It was fun, it was playful, it was nerdy. And yet, it got the job done. Can I go ahead and read you the article? It's not too long. Or read you the letter, rather? Dan Gingiss: You can, as long as you also promise to put it in our show notes at www.ExperienceThisShow.com. Joey Golden: I definitely will. So here's the letter, on Netflix letterhead, to the bar owners Danny and Dough Marx: "Danny and Doug, my walkie-talkie is busted, so I had to write this note instead. I heard you launched a Stranger Things popup bar at your Logan Square location. Look, I don't want you to think I'm a total wastoid, and I love how much you guys love the show. Just wait until you see Season 2. But unless I'm living in the upside-down, I don't think we did a deal with you for this popup. You're obviously creative types, so I'm sure you can appreciate that it's important to us to have a say in how our fans encounter the worlds we build. We're not going to go full Dr. Brenner on you, but we ask that you please, number one, not extend the popup beyond the six-week run that is scheduled to end in September, and two, reach out to us for permission if you plan to do something like this again. Let me know as soon as possible that you agree to these requests. We love our fans more than anything, but you should know that the Demogorgon is not always as forgiving, so please don't make us call your mom. Thanks." Dan Gingiss: Okay, that was awesome, first of all. Joey Golden: I mean, isn't that great? Dan Gingiss: I mean, I didn't understand it all because I don't watch the show, but I definitely get the gist. Joey Golden: Well, that's the thing. I don't understand it either. But you get that there are all of these insider baseball references. Dan Gingiss: Totally. The other thing that actually I noticed in part because I didn't get all of the references to the show, is that it's written in plain English. There's not a single legal word in this letter. Joey Golden: Absolutely, despite the fact that the recovering attorney in me notices they did the clear elements of a cease and desist letter, which is, you must let them know what they've done is wrong, you must let them know that it is a violation of your IP rights in this case, or intellectual property rights, you have to tell them what you want them to do, and you have to say, like, "Hey, you have to acknowledge this, or else we have to escalate things." And they did all four of those things, but in a really fun way, and not in a way that would lead to any type of a legal scuffle. If anything, I'm imagining that if I'm Danny and Doug, the two guys that started this popup, I read this, number one, I laugh, and number two I go, "You know what? That's right." And the thing I really loved about it is it doesn't say, "Stop right now." It says, "Okay, you can run this out until the end of September," which is when the popup bar was supposed to close. For context, the date on this letter is August 23rd. So they basically said, "Hey, don't do this anymore, but we're not going to shut your bar down a month early." Which I'm sure Danny and Doug appreciated, because that's a lot of revenue that you're missing out on. Dan Gingiss: For sure. And I mean, again, not to beat a dead horse on the language, but they don't use the word cease or desist. Joey Golden: No, not at all. Dan Gingiss: They use words like "please". "We ask you to please not extend the popup." They use words like, "Reaching out to us for permission." This is common language, and so it's completely understandable. I'll go one more. 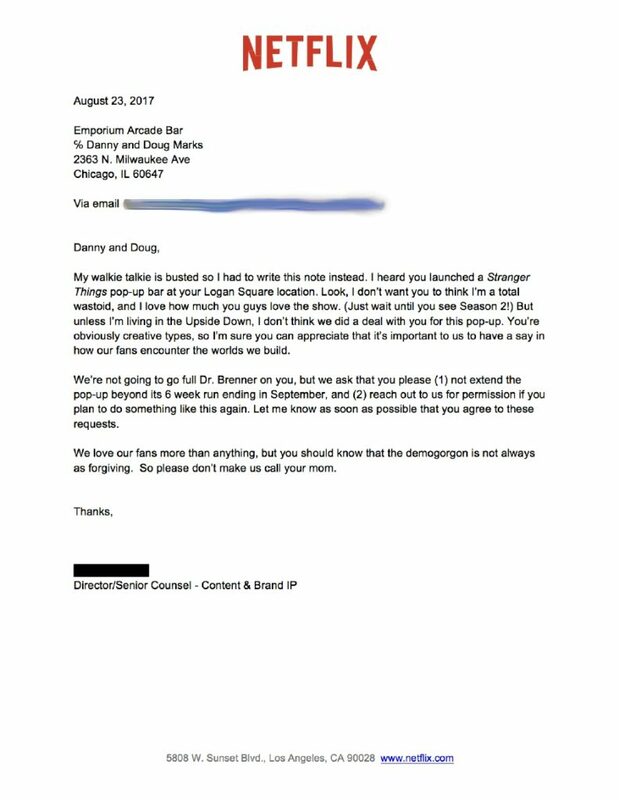 I'll bet Danny and Doug have printed this out, and have posted it in the bar because they think it's so awesome that they got a letter from Netflix. Joey Golden: Absolutely. And, Dan, while I have not been to the bar, I think there's probably a high likelihood of that, not the smallest reason why is no one in the public would know about this letter if they didn't share it. When in the article where I learned about this, they actually talked to Mina and were like, "You know, we appreciated it. We thought it was funny, and we're big fans of the show." And they didn't apologize, because I'm sure they had been briefed by their lawyers. But it was kind of like, "Hey, we really appreciated that they were cool about this, and we'll be cool, and we won't do it again." And I agree with you, it's just, this is something that I didn't understand when I was practicing law. Just be a good human being. Right? Just do the right thing. Like, this person's a senior counsel at Netflix. This is not a low-level gig. Right? This is probably one of the more senior lawyers, if not the most senior lawyer at the organization, and decided to have fun with a little popup bar, which in many ways most people would see as the little guy. And Netflix decided, "You know what? We're going to have fun with this and not be a bunch of jerks." And as a result, I would be willing to bet they got a lot of great publicity and press out of this. Dan Gingiss: But they also accomplished what they set out to do. So if you think about, "What was the point of the cease and desist letter in the first place?" They needed this bar to stop violating their intellectual property, and they got that. So they were able to achieve that with this kind of a letter instead of with the boring old legalese. Joey Golden: Absolutely. So let's do some quick takeaways. Number one, just because it needs to serve a legal purpose doesn't mean it needs to be boring or pick a fight. Just because you're a lawyer and it's a legal document, you don't have to be a jerk. Be a decent human being, and nine times out of ten, people will respond to your decency by being decent themselves. Dan Gingiss: Absolutely. And people will generally do the right thing if you give them a chance. I don't think these guys purposely violated this intellectual property, nor did they do so with any malintent, right? Because they're super fans. So they were doing this because they loved it. But the way that the lawyer approached it, he asked them to do the right thing, and he did it in a nice way, and so they were happy to do it. Joey Golden: Absolutely. And our third and final takeaway, go ahead and have fun with your required communications. You know, we talk about this on the show all the time, that making the required remarkable is something that you should be striving to do at every opportunity, and this cease and desist letter from Netflix is a perfect example of that. When you do make the required remarkable, people take notice, and they write about it, and it leads to more positive PR. And I guarantee that this exchange between Netflix and the owners of this popup bar is going to lead to more people tuning in to watch the show when Season 2 comes out. I absolutely guarantee that that's going to happen, because they did the right thing. Dan Gingiss: Stranger Things, indeed. Joey Golden: Stranger Things have happened. Dan Gingiss: All right, my man, Joey, I know you've been running around like crazy, because just getting you to record a podcast can be a little bit difficult. You've been traveling, writing a book, speaking all over the place. But have you had any chance to sit down and actually read a good book? Joey Golden: I actually have. One of the things that I try to do is, despite the fact that my schedule can get a little crazy, I try to make sure I read every single day. I'm about halfway through a great new book by Ray Dalio called Principles. Have you heard of Ray Dalio, Dan? Dan Gingiss: Why, yes. In fact, he is the CEO of, I believe, the largest hedge fund in the world. Joey Golden: Yes, my friend. You are correct. The hedge fund is Bridgewater Associates. And over the last 40 years, Ray grew it to be both the largest and best-performing hedge fund in the world. For context, they manage about $150 billion in global investments, and have made their clients money in 23 of the last 26 years. If you think back across the last 26 years of the market, to be winning 23 out of 26 is incredible. What I love about this book is, it's Dalio's first book, and he kind of sees it as the culmination of his learnings. He describes this in an observation, that, "There are only two things you need to do in order to be successful, and that is, first, to know what the best decisions are to be made, and second, to have the courage to make them." Dan Gingiss: Wow, I really like that. I mean, sometimes, especially those of us that work at companies, prioritization is one of the key challenges, so this idea of you need to know what are the most important decisions to be made I think is huge, and the other thing that often happens at big companies is that nobody wants to make a decision, or decisions take a really long time, and so this idea of have the courage, make the decision, deal with the consequences, move forward, I think that's exactly right. Joey Golden: I totally agree. The thing I'm loving about this book, first of all, it's filled with awesome stories. If you're not a finance person, you're still going to enjoy this book. I am not a finance and numbers person, but Ray writes in such compelling way, and kind of tells you the narrative of his life and how he grew the company. But the thing that I think is really interesting is he outlines this series of principles that he not only has lived his own life by, but that he's instilled into his company, and kind of made these the key foundational, if you will, core values of his entire business. It's interesting, in the book he has this definition of principles. He says, "Principles are fundamental truths that service the foundations for behavior that gets you what you want out of life. They can be applied again and again in similar situations to help you achieve your goals." What I love about this is the entire ... and a bit of a spoiler alert for the book, but it's so well-written, he basically says throughout your life you're going to be faced with decisions, and what you should do is you should actually figure out how you make your decisions, and then write those principles down. Write the defining principles on paper, physically. Because that's really rare. I mean, most people don't do that. Then, after you write them down, share them with other people. And that's really where this stuff starts to take off. Dan Gingiss: Yeah, you know, there was this thing I did at work a few years ago, and I can't remember the name of it, but I'm sure a lot of people listening will remember this. You end up getting these four, like, rubber Legos that you put on your desk, and they're four different colors, and they mean different things. The whole idea is that it communicates to somebody how you like to be spoken to. So some leaders, for example, I remember the red one is like, "Be brief, and then get out of my way." Like, "I don't want all the details, just tell me what I have to know." Whereas the green one is like, "I really want to work with lots of people and collaborate, and I want to talk about it," and what have you. The reality is, everybody's different, and so when you know how to communicate with somebody, and you know how they want to be communicated with, you can be a lot more successful. I think that's what Ray is saying here, is that we all live by a set of principles. They're not always the same. But having some concept of the principles that your boss lives by, or your coworker lives by, or even your spouse lives by makes it easier for you to work with that person, because you know the things that are important to them. Joey Golden: Absolutely. And I think what Ray Dalio did within his hedge fund is he, as the leader, kind of established these principles. But then, to your point, they operate on a really transparent basis where employees are constantly assessing their reactions to each other, and they have this really cool app that they talk about in the book where, if you're in a meeting, everybody has an iPad, and if someone's talking in the meeting, on your iPad it's asking you to score how they're doing, what you think of what they're saying, how they're making you feel, et cetera. Then, all of this information is being crunched on the data end in the back, and when it comes time for your annual review or something like that, they're bringing up the feedback of every interaction you've had. And it sounds crazy, but it dives into this whole belief that he has, that we need to have these core principles. And if everybody's operating from these fundamental truths, then it's a lot easier to be successful. I think the kicker is, 40 years later, he's got the largest hedge fund in the world, and they've been incredibly successful. So the fact that he's kind of, he's retired now, and that he's sharing these principles that served as the foundation of all of the success he had, I think it's just incredible. I love it when amazing people write books that share all the wisdom they've gleaned, because there's no faster way for you to learn and to really advance your own viewpoint of the world than by reading books that people who have been there, done that, got the t-shirt are kind enough to share. Dan Gingiss: Totally agree. And that ratings and reviews system sounds a little scary. I was imagining one of us speaking in front of an audience and getting the minute-by-minute feedback. It actually reminded me a little bit of Facebook Live. I don't know if you've spent any time on Facebook Live, but you can, when you watch the replay of a Facebook live, you can see where people hit the thumbs up button or the hearts, and you can actually, and they'll graph it out for you. So you can see, like, "Well, at this point in the video is where you had everybody's attention and they loved it. And over here people got a little bored and nobody was really doing anything." I mean, it's amazing feedback if you're tough enough to take it as a speaker or a presenter or something like that, but it sounds pretty neat. Joey Golden: Absolutely. I think one of the things that he talks about in the book is speaking to that very point, that people in the beginning are like, "Ooh, I don't know if I want the feedback." But then his takeaway, and I'm paraphrasing here, is, "That's how we get better. We bet better based on feedback, and if it's coming from a positive place of, "Let me help you to understand how you can communicate better with me in the future," if your goal is to be able to effectively communicate and be persuasive and get people's buy-in to your ideas and the things you want to do, of course you should want to know what you're thinking and how they're thinking." This book is chockfull of great advice. For the takeaways, I would say there's a couple. Number one, at the very lease, start writing down your principles; the fundamental truths you know to be true, in your personal life and your professional life. Then, number two, share these principles with your coworkers, your team members, your family members for the personal ones, because by sharing them, they'll have better insight into who you are, and by default they might do a similar exercise and come back to you. For more information, go grab a copy of Ray Dalio's new book Principles. You will not be disappointed. Dan Gingiss: And just to give you some feedback there, Joey. I think you did a 10 out of 10 on this segment. Joey Golden: Thanks, buddy. I appreciate that. Dan Gingiss: Okay, Joey. This week's number is 35%. What do you think it means? Joey Golden: I'm going to go with 35% represents the percentage of manganese in a handful of dry-roasted peanuts. Dan Gingiss: Yeah, mic drop. We're done here. How did you guess? Joey Golden: Shocking, right? Look at my skills. Dan Gingiss: All right. So, actually, you weren't even close. And I have a feeling that real answer is actually going to rile you up a little bit, Joey. Joey Golden: Oh, yeah. I've been known to be passionate about things. Dan Gingiss: All right. So 35%, it refers to the number of small business owners who are concerned about this question: "Should we be proactively reaching out and nurturing our customer relationships?" Now, this stat comes to us from our sponsors Oracle CX Cloud. Thank you, guys! Woo hoo! And their new report, Sleepless Over Customer Experience: Small Business Leader's Top Sales and Service Concerns and How to Fix Them. Joey Golden: Okay, I'm borderline speechless. 35% of small business owners are wondering if they should do that? You're killing me, Smalls. It should be 0%. What it should be is that 100% are proactively reaching out to nurture their customer relationships. What else are you doing? You bet this riles me up, Dan. Oh my gosh. If you are a business owner, I don't know if you're a small business owner, a medium-sized business owner, or a large business owner, the number one thing on your agenda every single morning should be, "How are we going to nurture the relationships with the customers we already have? How are we going to reach out to them? How are we going to take care of them? How are we going to make their lives easier? How are we going to make their lives better? How are we going to make sure that our employees know how to make their lives easier and better?" This should be the only thing that you're worrying about, or at the very least, the primary directive for every single day. Come on people. We can do better. Dan Gingiss: Riled up, Joey. Ladies and gentlemen, there he is. Dan Gingiss: Anyway, to find out more I go to Oracle.com/IncReport, that's /IncReport. Enter your email address and you can get the full report, Sleepless Over Customer Experience. And thank you again to Oracle CX Cloud for sponsoring the Experience This Show. Joey Golden: I may be riled up, but Oracle, we love you for sponsoring us. Thanks so much! Wow! Thanks for joining us for another episode of experience this! Dan Gingiss: We know there are tons of podcasts to listen to, magazines and books to read, reality TV to watch. We don't take for granted that you've decided to spend some quality time listening to the two of us. Joey Golden: We hope you enjoyed our discussions, and if you do, we'd love to hear about it. Come on over to ExperienceThisShow.com, and let us know what segments you enjoyed, what new segments you'd like to hear. This show is all about experience, and we want you to be part of the Experience This Show.